I love that version of Jane Eyre! Isn't it a wonderful story? I love blogging and it is just what I do before I got to bed at night and first thing in the morning. Yummmmm rolos:) And great guess to win the prize! I have not tried those products but sounds like good stuff! I love those rocks, they are gorgeous and I couldn't stop looking at them too! Have a blessed and restful night my friend! HUGS! How great to win extra bath/skin products! Maybe you should buy a lottery ticket! I haven't heard of that line. Sure looks very nice. you could make those rocks!!! Love how they look dressed! Love that Timothy Dalton Jane Eyre. 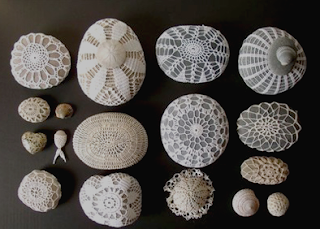 Also, check out this blog for more of those amazing crocheted stones. She does a fabulous job! I have not seen the production of Jane Eyre so I will have to add that to my list (probably in the fall, though - there's been no time for tv.) I caught part of "The Girl With the Pearl Earring" - a movie about the Vermeer painting. So I just finished reading (listening to) that. You might like it. 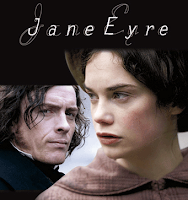 I have seen that version of Jane Eyre and I love it! Those crochet covered stones are absolutely beautiful! Wow -- you guessed the correct number of Rolos? That's amazing -- I can never guess that sort of thing correctly. Looks like you're good and busy -- and having a fun time! My daughter loves Lush products too. Congrats on your win! Lucky girl. Love those crocheted sea rocks. How beautiful and unique! I love Jane Eyre. You probably already know that since it is in my profile. I have my grandmother's old copy with tissue thin pages. Love your relaxing products. Whoo...so glad you won the $100! aaahhhh...a pedicure and massage sounds wonderful! The crochet stones are amazing!